Well, Labor Day weekend has come and gone. Fall is on it's way. Upon our arrival home from vacation Sunday, I noticed it was time to update our front door decor ... out with the summer and in with the: ...fall colors. Once again, I decided on the quick and simple route. 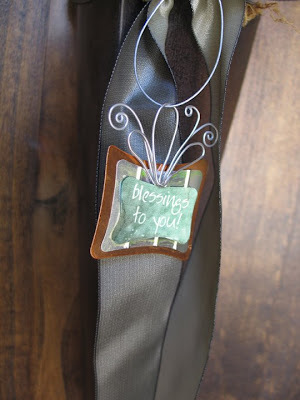 I made a little "blessings to you" embellishment using metal tags, paper and wire; fastened it to a satin ribbon on this craft-show purchase and I'm on to my next task! Very pretty! I need to add a ribbon to my door. Hey, thanks for visiting my blog. I love meeting other creative moms! You've got some wonderful ideas on your site. I'm in charge of crafts for my MOPS group and love your candle tag idea. We'll have to do that! Thanks for being a part of Fall Nesting Week! Such a beautiful door idea, thanks for sharing it! This is such a wonderful idea and so elegant at the same time. I definitely plan to try this myself. Thanks for the idea. thanks for stopping by the lylah blog, i'm so glad you did - so that i could get to "meet" you. Very pretty, I love it! I have a wreath similar to that, a Smith and Hawkins one from Target. Thanks for stopping in . I love your door hanging , real talent . It's so pretty - I love the little metal tag. Thanks for visiting and commenting on my blog so that I could come and find yours! Such a pretty door decor! I am so glad you added it to the fall nesting post! Great idea, thanks for sharing it with us! I'd love for you to come check out the new group "Seasonal Nesters" over at Blissfully Domestic! We are just getting started but I cannot wait for all the inspiration that will be shared through the seasons. I'd love to see you there! love that wall decor, a great idea! Wonderful idea. That looks a lot better than the standard wreath that hangs on most doors. 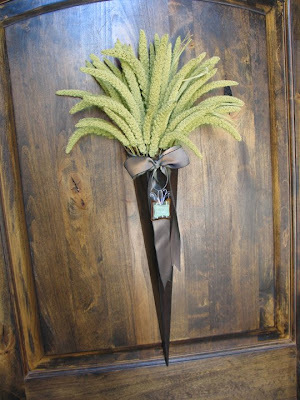 Love your fall door decor -- very "unique". Thanks for visiting me on my blog over at openhouse.homegoods.com -- now I know where to find you and your great ideas. I'll be back! oh my goodness....i adore the giraffe cake....you are so talented! Have a bliss filled week! It is rather interesting for me to read that blog. Thank author for it. I like such themes and anything that is connected to this matter. I would like to read a bit more soon. Pretty cool site you've got here. Thanks the author for it. I like such topics and anything that is connected to them. BTW, try to add some images :). Amiable fill someone in on and this enter helped me alot in my college assignement. Gratefulness you for your information. Correctly your article helped me truly much in my college assignment. Hats afar to you post, wish look ahead for the duration of more related articles promptly as its united of my favourite topic to read. It is very interesting for me to read that post. Thanx for it. I like such themes and everything that is connected to them. I definitely want to read more soon. It is extremely interesting for me to read this post. Thanks the author for it. I like such themes and anything that is connected to this matter. I definitely want to read a bit more soon.